Lawyer Lamber is a partner at one of the largest and oldest law firms in the West. Commentator Lamber is a legal commentator featured in national TV, print and web media. Community Lamber is the co-founder of the Stop Distracted drivers campaign. Marc Lamber is the co-author of “Experts 2.0: Using Technology to Put Expert Witnesses in the Spotlight” a Guide of Arizona Attorney Magazine. Marc Lamber on the legal implications of the FBI obtaining a master key to crack iPhones for ABC-15. Marc Lamber featured on Inc.com discussing implications in the personal injury space as it relates to self-driving vehicles. Marc Lamber on the cover of North Valley Magazine for a feature story exploring where new technology and traditional law merge. Marc Lamber featured in Disruptor Daily talking about the future of Artificial Intelligence (AI) and the law. Marc Lamber spotlighted in the ABA Journal with tips on how attorneys can better manage stress. Marc Lamber interviewed by Arizona Business Magazine on the legal implications of social media use. Marc Lamber covered for innovative legal thought. 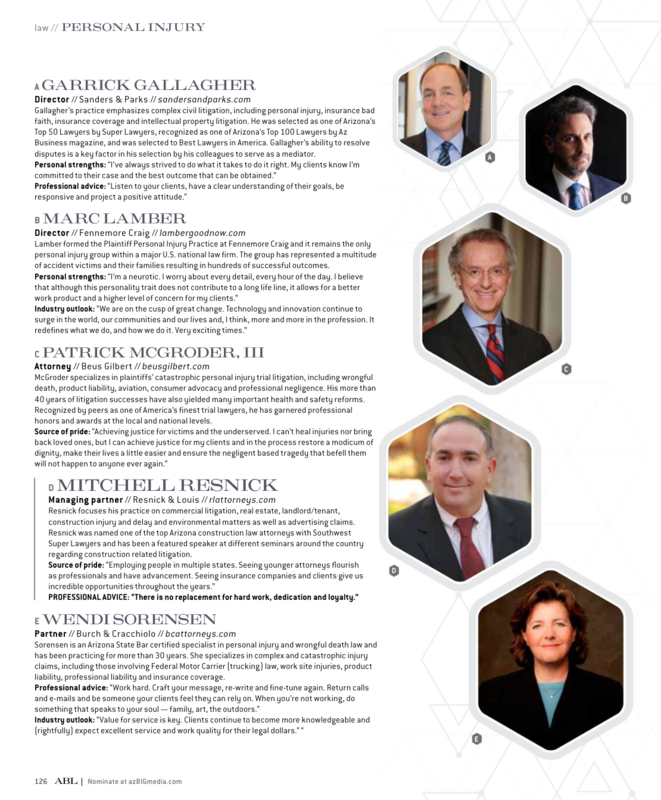 Marc Lamber featured in one of the world's most read online legal magazines (part 1 of 4). Marc Lamber featured for cutting-edge use of Apple Watch (part 2 of 4). Marc Lamber featured for use of 3D printing in ongoing feature series (part 3 of 4). Marc Lamber featured for iPad use. Marc Lamber featured for innovative use of video demand technology (part 4 of 4). Marc Lamber shares his Top 10 ways for lawyers to reduce stress for Rocket Matter. Marc Lamber opines on legal decision in Tom Brady/NFL case. Marc Lamber joins KTAR to discuss privacy issues involving Erin Andrews and Hulk Hogan.